"To listen to Jesus as Mary did, and to do what He says as Martha did, sums up the faith of the members of God’s family." A new article in the series on the virtue of faith. The Gospels tell us about our Lord’s journeys along the roads of Palestine. Many people met him on these journeys. Sadly, some did not recognize this compassionate, attractive, extraordinary Person as the Son of God. Others, however, believed in him and welcomed him. These included people in Galilee who had seen the signs he did, and many others whose names do not appear in the Gospels. Among those who said yes to Christ, we find the Twelve Apostles, Zacchaeus, and the centurion. In past articles in this series, we have been considering the example of faith left us by some of these people. Now we will look at Martha and Mary, who had the marvelous good fortune of being able to offer hospitality to our Lord. Faith requires the trust and abandonment in God that is the beginning of justification. This virtue also entails assent to a group of truths set forth to be believed. At the same time, faith, if it is true faith, works through charity, shown in specific deeds of love, because meeting Christ “gives life a new horizon, and a decisive direction.” “Far from divorcing us from reality, our faith in the Son of God made man in Jesus of Nazareth enables us to grasp reality’s deepest meaning and to see how much God loves this world and is constantly guiding it towards himself. This leads us, as Christians, to live our lives in this world with ever greater commitment and intensity.” Martha welcomed our Lord and showed her faith and trust in him by busying herself in serving. She did not just believe in Jesus, but let him into her life, acknowledging his lordship by her actions and honoring her Divine Guest with specific deeds. Hence just as Christ showed his love for his Father with deeds, we Christians as good children must show that our divine filiation is real, and bring it to maturity, by lovingly fulfilling God’s will. It is not enough to say that we believe in God, and that we abandon ourselves to his will, unless we confirm this with deeds: finishing our work as well as possible for love of him, being able to suffer for him, showing our loving concern for others in specific acts, accepting illness and setbacks. Saint Augustine wrote, “All your works must be based on faith, because the just man lives by faith and faith works through love.” Our good works, deeds carried out with hope and for love, will accompany us when we come to present ourselves before Almighty God. This is what Saint Josemaria meant when he talked about “operative faith,” faith that works by love and is seen in the daily lives of God’s children. 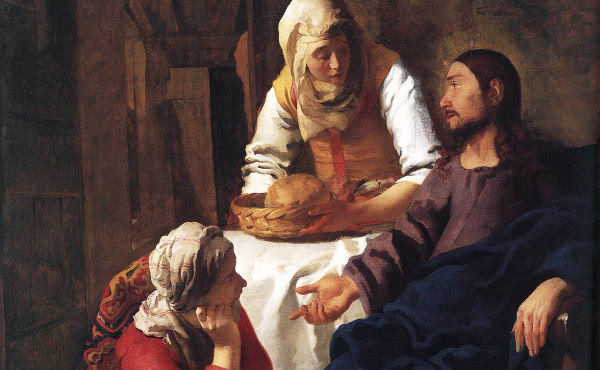 Martha, though at the start she complained about her sister’s apparent inactivity, is an example of faith in Jesus. Saint Josemaria encouraged us to imitate her trust in our Lord. “Make your worries known to him, opening your heart sincerely about them all no matter how little they may be.” For us too, the real sign that we believe in and love God will be our deeds of love: our desire to fulfill a specific act of piety or devotion with affection, our charity towards the people around us, the care with which we work, the effort we make to understand and help the people we know, and the endless list of things that fill our day. All these activities should reflect our faith, because they are started and finished for love of God and neighbor. Specific deeds carried out for love confirm the genuineness of our faith, for then faith is working in us through charity. Works, of course, must not replace faith. Then we would be at risk of activism, of doing things for the sake of doing them, letting ourselves be carried away by a whirlwind of activities. Jesus reproached Martha for having forgotten the most important thing. You are anxious and troubled about many things; one thing is needful. Our Lord repeats this teaching when he warns us about the danger of focusing too much on our immediate material needs. For all the nations of the world seek these things; and your Father knows that you need them. Instead, seek his kingdom, and these things shall be yours as well. Being busy about many things, activism, is a danger we always face. Faith without works is dead, while faith that is not nourished in prayer and adoration languishes. Our day, from morning until night, is filled with many different concerns: absorbing and demanding work, looking after our family, caring for our friends. But we want all these activities to be a place where we meet our Lord. Therefore we need to find some moments in the day to “sit” in God’s presence, to kneel before our Lord and adore him. And during this time we want nothing to distract us from contemplating, from looking at and listening attentively to our Lord. “Before any activity, before the world can change there must be worship. Worship alone sets us truly free; worship alone gives us the criteria for our action. Precisely in a world in which guiding criteria are absent and the threat exists that each person will be a law unto himself, it is fundamentally necessary to stress worship,” adoration. Faith, then, leads to adoration. Faith guides us to anticipate what our life with God will be for ever in heaven; it leads us to want to do on earth what the angels do in heaven, giving glory to God. Faith that adores leads us to prostrate ourselves before God and to desire to unite ourselves with Him. 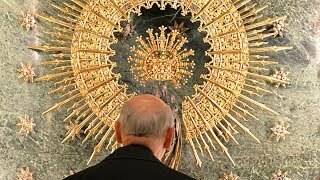 That is why faith, which is confidence in God and closeness to him, finds a culminating moment in Eucharistic adoration. “God our Lord needs you to say, on receiving him every morning, ‘Lord, I believe that it is You. I believe that you are really hidden in the sacramental species! I adore you, I love you!’ And when you go to the oratory to visit him, tell him again: ‘Lord, I believe that you are really present! I adore you! I love you!’ That’s how to show love for our Lord. And how our love for him will grow every day. And then go on loving him during the day, telling yourself: I am going to finish things very well for love of Jesus who is watching over us from the Tabernacle.” Hence we can understand why Saint Josemaria referred to the Tabernacle as Bethany and encouraged us to “enter inside” each one. Through our faith in our Lord’s sacramental presence we can enter into the Tabernacle and taste in advance the vision of God. And our spirit of adoration will lead us to stay close to him throughout the day in a union of love shown in all our activities. And if ever it seems difficult, or we don’t really know how to do it, we can find an example and help in our Mother Mary. She was the one who listened to God’s Word most attentively and who, with her fiat, put it into practice most faithfully. In our Lady’s life, at every single moment, faith acted through love. See Catechism of the Catholic Church (CCC), 26. Benedict XVI, Enc. Deus Caritas Est, 25 December 2005, 1. Pope Francis, Enc. Lumen Fidei, 29 June 2013, 18. Council of Trent, De Justificatione, 10. Saint Augustine, Enarrationes in Psalmos, 32, 2, 9. See The Way, 317, Furrow, 111, The Forge, 155, Friends of God, 198, etc. Benedict XVI, Speech to the Roman Curia, 22 December 2005. Saint Josemaría, notes taken in a get-together, 4 April 1970, in Javier Echevarria, Pastoral Letter, 6 October 2004. See The Way, 269 and 322.